Large swarms of winged insects inside and/or around the home is the most obvious sign of termite activity. Swarming occurs when reproductive male and female termites exit the colony and attempt to begin building a new colony. Since it takes most termite colonies at least three years to produce termite swarms, this is a likely sign of an ongoing problem. Dead termites or wings around windows, doors, heating vents, or in bath tubs and sinks, certain signs of termite activity. Termite mud tubes on walls located outside or inside the structure. The tubes are either round of flat and usually measure at least 1/4 inch or wider. They look like their name – a tube of mud. Live termites. Termites are sometimes found while doing home remodelling or repair. Worker termites are small, whitish creatures that will quickly move away when exposed to light. It is often difficult to determine the difference between termites and ants. 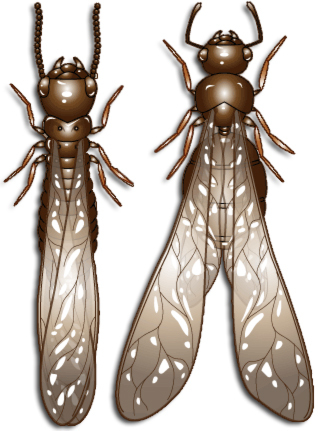 Termites have two pair of wings (front and back) and are of almost equal length. Ants also have two pair of wings but the fore wings are much larger than the hind wings. 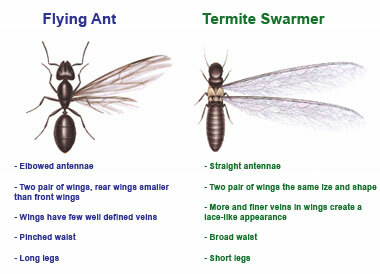 Termites have relatively straight antennae while ants have elbowed antennae. Ants generally do not swarm at the same time as termites, but it can happen. Responsible for millions and millions of dollars in damage to home/businesses each year. “We have been with Quality Commercial Pest Control for 9 months. Since they have joined our Company, we have not had any complaints. In fact we have had nothing short of excellence. "